Tuesday 14th March 2017: A Very Secret War: Trent Park & Bugging the Nazis in WW2, by Dr Helen Fry. During WW2, British Intelligence bugged the conversations of over 10,000 German Prisoners-of-War at three clandestine stately houses. Trent Park was reserved for Hitler’s Generals - they were housed in luxurious conditions in what turned out to be one of the greatest deceptions of the wartime. Lulled into a false sense of security, the Generals relaxed and became unguarded in their conversations. They inadvertently began to give away some of Hitler’s most closely-guarded secrets. Having worked through the declassified files, historian Dr Helen Fry sheds light on one of the least-known, but greatest deceptions of WW2. Historian Dr. Fry has written numerous books on the Second World War. Her book The M Room: Secret Listeners who Bugged the Nazis has been optioned for a feature film, and was the subject of the Channel 4 documentary Spying on Hitler’s Army. Helen has written over 20 books, including Spymaster: the secret Life of Kendrick; Freud’s War; From Dachau to D-Day; and Churchill’s German Army. Tuesday 11th April: Where Moses Stood - Robert Feather. Lectures are held at Avenue House, 17 East End Road, Finchley, N3 3QE, and start promptly at 8 pm, with coffee/tea and biscuits afterwards. Non-members: £1. Buses 82, 125, 143, 326 & 460 pass nearby, and Finchley Central station (Northern Line) is a 5-10 minute walk away. Mary Phillips was appointed a Vice-President at the AGM on Tuesday 5th May 1992 at Hendon Library. At that time there were discussions concerning the high cost of the Garden Room at Avenue House, in which the Sunday morning group were already meeting. A member of HADAS at the time named Andrew Pares, who was a former Mayor, suggested that Councillor Mary Phillips should be invited to be a Vice-president as she may be able to be of assistance. Although I was not a member of HADAS at the time, I did know Mary and had met her sometime in 1977. She was born in Finchley and lived in the area for all her life. As a child, she attended Manor Side School and later went to Henrietta Barnett School. During the war, so her daughter tells me, when the siren sounded, the girls would hide in a cupboard. Mary trained as a teacher at Doncaster Training College and then returned to Finchley and met her future husband, Godfrey, at the Young Conservatives. Mary spent most of her teaching career at Goodwyn School in Mill Hill, which is where I met her. She served as a Councillor for many years and was always trying to sort out people’s problems. She and her husband were very involved with the organisation of Finchley Carnival, and Mary also organised events for raising funds each year for the Mayor’s appeal, with a sponsored swim at Copthall Pool, as well as musical social events at Church Farmhouse Museum. She was also on many other committees. She was one of life’s “doers”. She maintained her interest in HADAS, and always read the Newsletters until this became impossible for her. Mary passed away recently, and as I reported at last Year’s AGM, she was being cared for in a home in Cockfosters where she had been for a few years. Surely our oldest member, Dorothy Newbury celebrated her 97th birthday recently. HADAS Committee and members send their best wishes and congratulations. This work was undertaken by Curator of Aircraft and Exhibits and member of local group Hendon and District Archaeological Society (HADAS), Andrew Simpson. Site access via the contractors (SDC builders Ltd) was arranged by RAFM Centenary Programme Manager Rebecca Dalley and Steve Johnson, SDC Site Manager, to whom thanks. The provisional site code RAFMH17 was allocated. NGR TQ22079039. Much of the RAF Museum Hendon site is currently being redeveloped as part of a major Heritage Lottery Fund (HLF)-funded project to mark the Centenary of the Formation of the Royal Air Force (RAF) on 1 April 1918. Part of this work involves major ground works to change the layout of the external parts of the site. To this end, the contractors have excavated a number of machine-cut trenches to check for services and ground conditions. On the western part of the site this involves the replacement of a large grassed area by car parking. This area served for many years as an occasional visiting helicopter landing pad and events area. The Curator of Aircraft suggested that the opportunity be taken to investigate the excavated trenches for any archaeological features or finds of interest. Until creation of the original aerodrome from February 1910, the area occupied by the RAF Museum and former RAF Hendon appears to have been low-lying and fairly boggy pasture land with many trees. The nearest major archaeological evidence lies to the east on the area of Greyhound Hill and Hendon Burroughs, where work by HADAS and others mainly since the 1960s has established evidence of undefined Romano-British occupation of first-fourth century date, possibly of agricultural/farming nature, plus evidence of Saxon occupation from at least the seventh/eighth century, and Saxo-Norman occupation; then virtually continuous occupation through to the modern day, other than a possible hiatus around the time of the Black Death. In November 1992, a professional archaeological watching brief was carried out by Museum of London archaeologists, covering five machine-cut trenches, cut to a depth of 50cm, on the site of the new Colindale Police Station, within the former RAF Hendon East Camp, immediately adjacent to Hangar One (the former Battle of Britain Hall), found only underlying London clay, modern field drains and 17th-18th century pottery and clay pipe. (Site code GPW92; NGR TQ2193 9011). This was reported in HADAS Newsletter 261, December 1992. It was suspected that similar material might be found at the museum site. Andy Renwick, Curator of Photographs and writer of “RAF Hendon The Birthplace of Aerial Power” (Crecy, 2012), suggested that field drains dating to RAF improvements to the site drainage in the summer of 1926 would be likely to be found. The London Aerodrome was created on land leased by the Brinckman family, with the area now occupied by the museum and its grounds forming part of one large field in the main, with a field boundary, as indicated by contemporary maps, running SW from roughly the centre of the current main building. An afternoon was spent investigating three machine-cut trenches and their adjacent spoil heaps, and disturbed ground around the edges of the trenches, using a hand trowel only. The first trench investigated was the long one running N-S at the centre of the former helicopter pad. The west-facing section was cleaned and showed a top turf humic layer some 5cm thick; all recovered finds appeared to originate from this context, 001. It overlay a hard-packed clay subsoil some 20cm thick, context 002, which appeared to be virtually sterile other than for one or two very small flecks of red brick or tile. This in turn overlay natural London clay, 003. Contexts 002 and 003 were cut by two lines of field drain running approximately east–west across the trench (presumed to be those laid in 1926 as referred to above), lying in an ash/clinker-lined cut, the ash/clinker including some fragments of modern pottery (not retained). The field drain sections in unglazed red earthenware fabric varied slightly in length, but a recovered example is 298mm in length with an external diameter of 11cm and a central bore of 75mm. Recovered finds from this trench include three short lengths of updateable clay pipe stem, and a selection of modern stonewares and earthenwares. This was the trench with the least evidence of recent ground disturbance. The second trench investigated, to the north adjacent to the main gate, showed much more evidence of recent disturbance, with a thick (20-25cm depth) but unevenly spread layer of ash/clinker running across the trench just below the turf/topsoil line (which was noticeably deeper in this trench – average 20cm), and overlying the natural London clay. Andy Renwick points out that in 1926 the little-used former railway spur running around the site boundary from Silkstream Junction on the Midland Railway main line across Aerodrome Road to sidings fronting the Edgware Road was lifted, and its ballast used to fill an area of boggy ground near the former Aerodrome Hotel; this may be more of that same material, lying just below the current turf line. Finds from this trench were limited to just three small sherds of pottery. Investigation was limited by waterlogging of much of this trench after recent heavy rainfall. The third trench was the southernmost, just to the north of Hangar One. This again showed considerable evidence of recent disturbance, with much ash/clinker forming a layer between the topsoil and natural clay, containing modern pottery and glass including bottle necks. Site manager Steve Johnson suggested this may be redeposited rubble from the London Blitz. Certainly very similar material was used to backfill an uncompleted air raid shelter at Martin School, East Finchley, investigated by HADAS in 2013. Investigation was again limited by waterlogging of much of this trench after the recent heavy rainfall. A brief check was made of two or three very small square trenches to the east of these three main trenches. These had been dug over the line of services and no features or finds were noted. A selection of the recovered finds was kindly examined by Jacqui Pearce FSA, pottery specialist for Museum of London Archaeology (MOLA). There was a good selection of Victorian and later pottery from the central trench. This included a ribbed body sherd of stoneware – possibly a marmalade jar - a rim sherd of a bone china serving dish with floral decoration; part of a stoneware bottle; part of a redware lid, probably from a teapot; a section of handle from a Victorian Rockingham-type earthenware teapot, originally made near Rotherham in South Yorkshire (MOLA code ROCK, 1800-1900); and refined white ware body sherds. There was also a single piece of partially fire-melted green bottle glass, and a similarly fire-damaged sherd of stoneware, the latter two possibly analogous with the material from the Hangar One trench. The three small sherds from the ‘Bloodhound Trench’ include two of Refined white earthenwares (MOLA code REFW, 1805-1900) – one a section of foot rim - and a rim sherd of Transfer Printed Ware (TPW, 1780-1900). This was a useful exercise in confirming that in this part of the site at least there appear to be no significant archaeological features. It is interesting that the small selection of finds recovered are virtually all of Victorian or later date, with no sign of the earlier pottery recorded just next door on the Police Station site. Only the clay pipestems may be a little earlier, but clay pipes did remain in fairly general use until the Great War period, when supplanted by cigarettes. Any further site observation may be taken as appropriate, and the finds retained for possible formal/informal display to various museum stakeholders and audiences. It is nice to know the positive effect that the work of our digging team has contributed to the school. Recently I was looking at the catalogue of “The Making of England - Anglo-Saxon Art and Culture AD 600-900” an exhibit which was held at the British Museum in 1991. A photograph on page 98 shows two very similar pins to the Church Terrace example from the S. Humberside, Flixborough site - a particularly well-preserved high-status site. The finds are in the Scunthorpe Museum. At the time of the exhibition, detailed analysis and phasing of the site had not been resolved, but it was stated that all the finds date from the eighth or ninth century. The Flixborough pins are not mentioned in the “A Hamlet in Hendon” Report when reviewing other examples. These pins are slightly shorter than the Church Terrace pin, i.e. 570mm & 515mm rather than 161mm, and the spirals are not so tightly wound. Add these two pins to the York find mentioned in the review, and it would suggest a wider distribution than that of the southern and eastern England suggested in the Church Terrace report. The HADAS membership year runs from 1st April to 31st March, and so all members who pay by cheque will now be required to renew (except those people who have joined since January this year). Please therefore find enclosed a renewal form, and I would ask that you fill it in and return it to me along with the appropriate amount as soon as possible. The current rates and where to send your payment are on the form. Many thanks. In September of 2016, the Bank of England introduced a polymer £5 note. One comment was that the new note would survive in a washing machine, though I have not had the courage to test it. Since the introduction, the old notes have started to be withdrawn. After 5th May 2017, the old notes will no longer be legal tender, though they can be banked at banks, building societies and the post office, so when this Newsletter is issued, you have just over two months left to use them in shops. Current plans are to introduce a new £10 note featuring Jane Austen this summer, and a new £20 note in 2020. There are no plans as yet to replace the £50. Our last day on the trip. And because our hotel was some distance from the town, denying us the opportunity of exploring, we now had a little time to rectify the omission. We had spent time at the Tithe Barn on Wednesday (see January newsletter). Most people started with the Saxon church, though Simon had been there on the Wednesday. After “doing the town,” we boarded our trusty chariot for a visit to the Steam Museum in Swindon, and thence to another tithe barn, this one at Great Coxwell. The church was probably a chapel built to house the body of Saint Anselm. Tall and narrow, it is delightful in its unaltered integrity inside and out, save one missing porch, with a sense of being windowless - in comparison with subsequent trends: as a place of inner peace and refuge within the precinct of a monastery: a sanctuary from the savage and 'Godless' world outside? It has miraculously escaped the heavy hands of the Normans, Gothic 'improvers', and the C19 'restorers'; as testimony to an astonishing time-warp it still stands apart, dominant in its own space. Recorded to have been founded c.675-709; and to be forgotten through time. Escaping through change of use: the nave as a tiny school, the chancel as a tiny dwelling, only to be rediscovered in 1856. The fine external stone pilaster stripwork dates from C10-11. Only the austere Escomb Church near Durham, can rival it for age and preservation, though lacking its sense of place, being rather deplorably surrounded by a modern housing estate! Today Bradford on Avon is an interesting, rather touristy market town. It is difficult to imagine it as the noisy, smoky centre of a manufacturing area. The local museum run, as so often, by volunteers, is housed in part of the modern Public Library building. Their room is quite small and densely packed with interesting exhibits. It was fortunate that our visit did not coincide with an excited school group. The sections on local industry and social history were particularly well displayed. The centre piece is the Christopher Shop. This pharmacy was established in 1863, and remained much the same until the final owner, Angela Mary Christopher, decided to retire in 1986. There was no buyer and the Bradford on Avon museum Society was formed to preserve the contents. This developed into the current museum, opened in 1990. 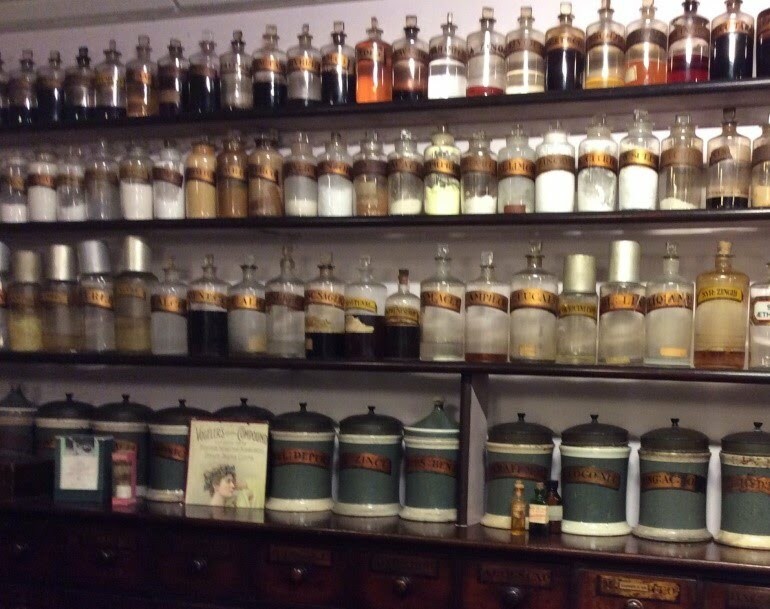 The Christophers were antiquaries and kept all the bottles, jars and pharmacy equipment from before the era of pre-packaged medicines. Past industry in the area has included weaving woollen cloth (first mentioned in 1540), iron and brass working, and vulcanised rubber manufacture (since 1848). It was a surprise to find that Moulton Bicycles were designed there in 1962 and are still made in the town. In recent years, many of the industrial premises have been converted into private residences and shops are changing. The Museum Society retrieves and preserves as much as it can. The Iron Duke (photograph below) is a piece of industrial archaeology of national importance. Built in 1849 for Stephen Moulton to start his rubber manufacturing business in Bradford on Avon, it was the first machine of its type in Europe. The Iron Duke is a rubber-rolling or calendering machine, vulcanising rubber and cotton fabric to make waterproof sheeting. The rubber industry grew to dominate life in Bradford. When the Spencer Moulton factory closed in 1973, the Iron Duke was dismantled and stored at Bristol Museum, in the hope that one day it could be restored and put on public view. The Bradford on Avon Preservation Trust, the Bradford on Avon Museum Society and BoaCan (the Bradford on Avon Community area Network) joined forces to bring the Iron Duke back to Bradford on Avon, where it was a working machine for over 100 years. The size and weight of the machine preclude siting it in the museum, so it was agreed to locate the restored Iron Duke on part of the old factory site. Planning permission was duly obtained and a shelter and a plinth designed. The official unveiling of the machinery was to take place on 26th September, the day after we were leaving, but everything was prepared, including displays explaining the social, cultural and economic impact of the rubber industry on Bradford on Avon and surrounding areas. The bridge was widened and lengthened in the 17th century. In 1643 there was a skirmish on the bridge, and the Royalists seized control on their way to the Battle of Lansdowne. The chapel was converted into a lock-up for the town’s miscreants. The prisoners here were provided with a loo which drained directly into the river. They were more fortunate than most 20th century prisoners, as there was no slopping-out in the bridge prison. Post Script: shortly after our visit, traffic chaos hit Bradford on Avon, as the Town Bridge needed urgent repairs after a car ploughed into it on 3rd October, causing thousands of pounds’ worth of damage. The impact caused when a black Mercedes C180 crashed into the stonework just before 3am on Tuesday sent a three-metre chunk of the parapet hurtling into the River Avon. Our penultimate call on the way back to London was to Swindon for the superb Steam Museum of the Great Western Railway – God’s Wonderful Railway or the Great Way Round, depending on your ‘Big Four’ pre-Nationalisation Railway Company affiliations! The GWR of course was the home of Brunel’s Broad Gauge – 7ft 0 ¼ inch as opposed to the standard gauge of 4ft 8 ½ inches – the Broad Gauge ended in May 1892 and relics are few, other than one original loco and three replicas. The one shown here along with a representation of the great man himself- – North Star – is a replica built by the GWR in 1925, incorporating the main driving wheels and name/works plates of the original of 1837, preserved from 1871 to 1906 then tragically scrapped ‘to save space’ at Swindon Works. One of the first locos the visitor encounters is the magnificent 4073 “Caerphilly Castle” express passenger loco – once familiar to visitors in the splendid road and rail transport gallery at the Science Museum, South Kensington, from the 1960s through to the 1990s. There are plenty of dioramas, signal levers to pull, loco footplates to step on and short films to watch. Swindon has had its own Railway Museum since the early 1960s, and after the tragic closure of Swindon Works by BR in 1985, part of the site was retained to house the new Steam Museum. Part of the adjacent works buildings now house a large shopping outlet – and another GWR ‘Manor’ class loco on loan from the Severn Valley Railway. Also nearby is a major HQ building of the National Trust, and the home of the National Monuments Record. Described by William Morris as “unapproachable in its dignity, as beautiful as a cathedral, yet with no ostentation of the builder’s art” and “the finest piece of architecture in England “, Great Coxwell Barn was once part of a monastic grange owned by Beaulieu Abbey. Dating from c.1300, the walls were constructed from Cotswold rubble-stone, with ashlar blocks in the buttresses and doorways, and a Cotswold slate roof. The wooden frame supporting the roof rests on 6 pairs of stone pillars which divide the interior into 7 bays and 3 aisles. At 144ft x 38ft (43.94m x 11.63m) 5502sq ft (511 sq m) it seems enormous but is approximately half the floor area of the barn that stood at the Beaulieu St. Leonard’s home farm. Externally, slit windows allowed for air flow rather than light, as did the putlog holes that supported scaffolding during construction. The main porched doorway is on the west (farmyard) side and, like most of the barn, shows evidence of the changes made over the centuries. In the opposite wall, facing the road, is a doorway with a smaller porch, incorporating a dovecote. The large openings in the gable ends are probably 18th Century in date. The centre bay beyond the west porch was the threshing floor, and the pillars on either side of the east door have slots to hold the baffle board or ‘threshold’ that prevented the grain from being blown away during the threshing and winnowing processes. Crops would be delivered to the barn by the wagonload, stored, threshed, and then stored as grain either for use or (the majority) for sale. Wagons would have drawn up to the west porch to be unloaded. Certainly the doorway appears not to have been wide enough to allow admittance, and there is a step up. As the interior of the east porch has tally marks, it is possible that grain to be sold was loaded out from there. In the upper part of the west porch there is evidence of a small chamber, possibly for the granger to oversee and supervise operations. Internally, the roof construction can clearly be seen. The complex system of supports, braces, beams, rafters, purlins and laths, held together with pegged joints familiar to a modern craftsman, would certainly have been interesting to William Morris. So interesting in fact, he was moved to add his name to the wealth of graffiti that adorn the walls. These are names, dates, daisy wheels (thought to be apotropaic), the interlaced ‘V’s that resemble a ‘W’ but in fact stand for ‘Virgo Virginum’, the ‘M’ for ‘Maria’, preparatory marks for further embellishment, and tally marks. It is not just time that has left its mark on the barn. (Quotation on crop and barn security copied from the 1996 NT leaflet about the barn). Wednesday 8th March, 6 pm Gresham College at Museum of London, 150 London Wall EC2Y 5HN. The Value of Heritage and the Heritage of Value. Simon Thurley. Free. Friday 10th March, 7.45 pm, Enfield Archaeological Society, Jubilee Hall, 2 Parsonage Lane, junction of Chase Side, Enfield EN2 OAJ. The Must Farm Archaeological Project. Talk by Mark Knight, visitors £1. Refreshments, sales and information from 7.30 pm. Thursday 23rd March, 6pm, Gresham College, Barnard’s Inn Hall, Holborn EC1N 2HH. The Rise and Fall of Sourdough – 6,000 Years of Bread. Fullbright Lecture, given by Professor Eric Pallant. (Covering food history of the Western World). Free. Friday 7th April, 7.45 pm, Enfield Archaeological Society, Jubilee Hall, 2 Parsonage Lane, junction of Chase Side, Enfield EN2 OAJ. E.A.S. Fieldwork in 2016. Church House, Wood Street, Barnet (opp. Museum). Talk by Martin Bearne, preceded by AGM. Visitors £1. Monday 10th April, 3 pm. Barnet Museum & Local History Society. Church House, Wood Street (opposite Museum). Hadrian’s Wall and Life on Rome’s Northern Frontier. Talk by Matthew Symonds. Visitors £2. Wednesday 19th April, 7.30 pm, Willesden Local History Society, St Mary’s Church Hall, Neasden, NW10 2TS (nr. Magistrates’ Court). George Furness – Willesden’s Greatest Resident. Talk by Margaret Pratt and Cliff Wadsworth on one of Willesden’s greatest Victorians, running the local brickworks, building houses, roads and sewerage. Wednesday 26th April, 7.45 pm, Friern Barnet & District Local History Society, North Middx. Golf Club, The Manor House, Friern Barnet Lane, N20 ONL. The Hunting of Hepzibah – a Family History with a Twist. Talk by Jim Nelhams (HADAS) £2. Thursday 27th April, 8pm, Finchley Society, drawing room, Avenue House (Stephens’), 17 East End Road, N3 3QE. The Regent’s Canal (and Museum) by Roger Squires. £2.